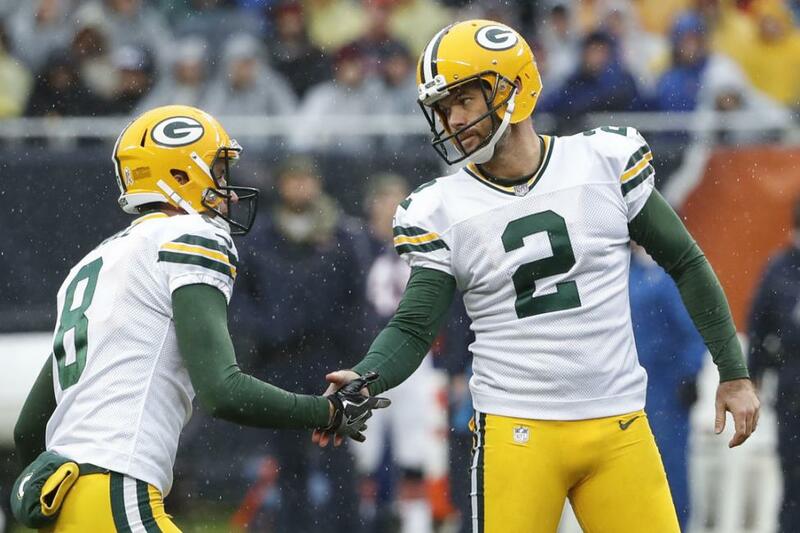 Green Bay Packers placekicker Mason Crosby bounced back from four missed field goals last week in the loss to the Detroit Lions by making all four of his tries, including the 27-yard game-winner with no time remaining, Monday night against the San Francisco 49ers at Lambeau Field. Green Bay (3-2-1) won 33-30 behind Crosby's kick, which was set up by an 81-yard drive engineered by veteran quarterback Aaron Rodgers. The Packers and Rodgers were given life after Kevin King's interception of a C.J. Beathard deep pass with 1:07 left. The game-winning drive was extended after 49ers cornerback Richard Sherman was called for an illegal contact penalty on third-and-15 that voided a sack of Rodgers with 43 seconds left. Rodgers later rushed up the middle for a 21-yard gain. Rodgers, a two-time NFL MVP, completed two more passes for 19 yards to set up Crosby's game-winner for Green Bay. Crosby went 1-for-5 with his field goals in the loss to the Lions last week. "It's very apropos what (Crosby) went through last week," said Rodgers, who completed 25 of 46 passes for 425 yards with two touchdowns and no interceptions. "The guys were happy for him. They wrapped their arms around him, encouraged him, and it was great. "I was at first trying to see if the crowd was sarcastic cheering for him, but I truly believe the crowd encouraged him. It was a heartfelt encouragement for him." Crosby said it was a "special" night after a "great week of work" despite his woes against Detroit, which drew criticism from Green Bay fans. "What a gutsy deal to get down here and have a chance to win that thing," Crosby said. "So thankful for another opportunity and to have it end like that." An upset loss to the 49ers, who are now 1-5, would have been tough for the 49ers to swallow with four of the next five games on the road, including two against the Los Angeles Rams and New England Patriots after a bye this week. "I don't know if it was a season-saving win for us but it was definitely an important one," Rodgers said. "I never like to use the term must-win but it was important." Three Green Bay receivers went over 100 yards against the 49ers: receiver Davante Adams (10 catches for 132 yards with two touchdowns), tight end Jimmy Graham (five catches for 104 yards) and receiver Marquez Valdes-Scantling (three catches for 103 yards). Beathard was 16-of-23 for 245 yards with two touchdowns and the late interception. His top target, receiver Marquise Goodwin, had four receptions for 126 yards and both scores. Running backs Raheem Mostert and Matt Breida combined for 148 rushing yards on 26 attempts. "It hurts because you're so close. You feel like you could've, should've won the game," Beathard said. Rodgers rallied the Packers to tie the game at 30 after completing a 38-yard pass to Adams to the San Francisco 20. A 4-yard pass to Graham got the ball to the 16, for a third-and-6, at the two-minute warning. Rodgers hit Adams in the end zone for the score, and Crosby's PAT tied the game with 1:55 left. A personal foul for a late hit on Packers cornerback Tony Brown on the kickoff return gave the 49ers the ball on their own 47 to start the next drive. On third-and-3, King intercepted Beathard on a deep ball for Goodwin, and the Packers took over on their own 10 with 1:07 to go. "It's a play if you hit it, it looks great. If you don't, it's not great," Beathard said of the interception. "I feel like obviously I could have put the ball in a better spot if I could have it back." With the Packers out of timeouts, Montgomery ran for 14 yards on the first play and got out of bounds. On third-and-15, an illegal contact penalty negated a 49ers sack, and the Packers got a gift first down at the 24 with 43 seconds left. Rodgers scrambled for 21 yards to the 45 and spiked the ball with 19 seconds left. An 8-yard sideline pass to Adams put the ball on the San Francisco 47 with 15 seconds left, and a back-shoulder throw to rookie Equanimeous St. Brown was good for 19 yards and out of bounds at the 28 with 11 seconds to go. Rodgers found Adams down the far sideline for 19 more yards to the 9, and out of bounds with 6 seconds on the clock. An incomplete pass brought on Crosby with 3 seconds left for the game-winning field goal.